It's easy to make your own super nutritious granola bars. 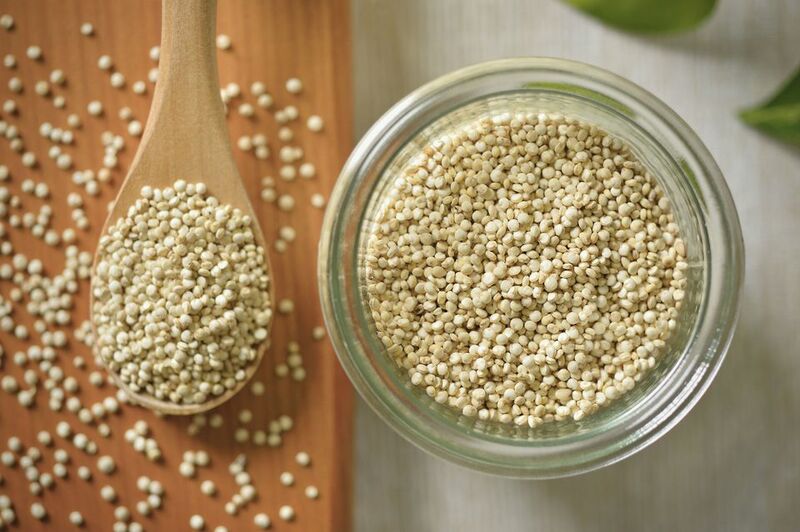 Quinoa has a complete array of amino acids for grain and is rich in iron. Quinoa is usually sold in its natural state - it resembles tiny seeds - which can be cooked in water into a rice-like pilaf. But you can also buy quinoa flakes, in which the grain is processed to look like oatmeal. Quinoa flakes can be substituted for oatmeal in any baked good. Add whatever dried fruits or nuts you like to these granola bars. Line a 9x9 or 9x13 inch pan (depending on how thick you like your granola bars) with foil or parchment paper, letting the paper overhang the sides. Spread the oatmeal, quinoa, and chopped nuts on a baking sheet and toast in the oven until golden and fragrant, about 10 minutes. Melt the butter over low heat with the honey and brown sugar until the butter is melted and the sugar is dissolved. Remove from heat and stir in the vanilla and the salt. Stir the butter/sugar mixture into the toasted oats and nuts. Stir in the eggs, chocolate chips, and dried fruit. Spread mixture into the baking pan and press firmly into pan. Let cool completely, then lift from pan using parchment, and cut into bars. Store granola bars in an airtight container.